(Nanowerk News) People have been combining materials to bring forth the best properties of both ever since copper and tin were merged to start the Bronze Age. In the latest successful merger, researchers at the National Institute of Standards and Technology (NIST), the University of Maryland (UM) and the U.S. Food and Drug Administration (FDA) have developed a method to combine two substances that individually have generated interest for their potential biomedical applications: a phospholipid membrane "bubble" called a liposome and particles of hydrogel, a water-filled network of polymer chains. The combination forms a hybrid nanoscale (billionth of a meter) particle that may one day travel directly to specific cells such as tumors, pass easily though the target's cell membrane, and then slowly release a drug payload. In a recent paper in the journal Langmuir ("Microfluidic Directed Self-Assembly of Liposome-Hydrogel Hybrid Nanoparticles"), the research team reviewed how liposomes and hydrogel nanoparticles have individual advantages and disadvantages for drug delivery. While liposomes have useful surface properties that allow them to target specific cells and pass through membranes, they can rupture if the surrounding environment changes. Hydrogel nanoparticles are more stable and possess controlled release capabilities to tune the dosage of a drug over time, but are prone to degradation and clumping. The researchers' goal was to engineer nanoparticles incorporating both components to utilize the strengths of each material while compensating for their weaknesses. 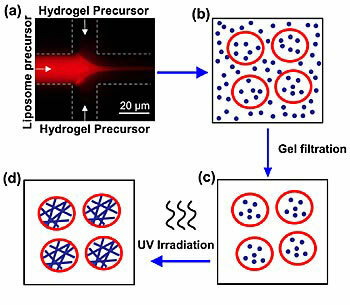 Schematic depicting the creation of liposome-hydrogel hybrids. A solution containing phospholipid ("liposome precursor") mixes with a solution containing hydrogel precursor (a). Blending together at the interface of the two channels, the phospholipid forms liposomes (b) that trap the hydrogel precursor inside. Material outside the vesicles is removed (c) and the liposomes are UV irradiated. This polymerizes the protein chains in the hydrogel and yields a liposome-hydrogel hybrid (d). To manufacture their liposome-hydrogel hybrid vesicles, the researchers adapted a NIST-UM technique known as COMMAND for COntrolled Microfluidic Mixing And Nanoparticle Determination that uses a microscopic fluidic (microfluidic) device (see "NIST, Maryland Researchers COMMAND a Better Class of Liposomes" in NIST Tech Beat, April 27, 2010). In the new work, phospholipid molecules are dissolved in isopropyl alcohol and fed via a tiny (21 micrometers in diameter, or three times the size of a yeast cell) inlet channel into a "mixer" channel, then "focused" into a fluid jet by a water-based solution added through two side channels. Hydrogel precursor molecules are mixed in with the focusing fluid. As the components blend together at the interfaces of the fluid streams, the phospholipid molecules self-assemble into nanoscale vesicles of controlled size and trap the monomers in solution inside. The newly formed vesicles then are irradiated with ultraviolet light to polymerize the hydrogel precursors they carry into a solid gel made up of cross-linked chains. These chains give strength to the vesicles while permitting them to retain the spherical shape of the liposome envelope (which, in turn, would facilitate passage through a cell membrane). To turn the liposome-hydrogel hybrid vesicles into cellular delivery vehicles, a drug or other cargo would be added to the focusing fluid during production.